Our decorative ceramic tiles provide a unique Spanish decor accent. 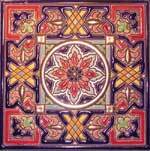 Some of our decorative tiles come with wood frames and all are hand enameled and many come are accented in 24k gold. These Spanish tiles provide the perfect accent and can be hung from a wall using the hanger included on the back of the tile, or they can be used in combination with one of our gold plate stands or standard plate stands. 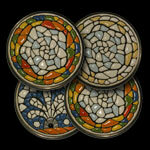 Ceramic Drink Coasters/Tile Coasters We now have ceramic tile drink coasters. The new furniture coasters are made using the same technique as our spanish plates! Our ceramic coasters are available in several styles to choose from and would add the perfect touch to your spanish style decor. The drink coasters feature a durable ceramic and enamel surface and plastic ring that keeps the coaster above the table and avoids breakage if the coaster is dropped on a hard surface. There enameled finish is textured, so your drink will not stick to the ceramic finish like it would with other drink coasters that have a smooth flat finish.